The Trash Can: Get saved from BURNING in hell forever by JESUS through The Gospel that SAVES FOREVER! Get saved from BURNING in hell forever by JESUS through The Gospel that SAVES FOREVER! Everything else is TOTALLY IRRELEVANT, even DEATH ITSELF! I'm excited to share this album and band's passionate LOVE for JESUS CHRIST. I never heard of Jerusalem until I saw them at Cornerstone '85. I've never forgotten Ulf repeating over and over, “LOVE IS YOUR WEAPON”. https://www.youtube.com/watch?v=yarKz... Many people may not know about this band nor album. I am sharing it to educate and spread awareness. I purchased the original vinyl record. If you enjoy this artist, purchase their music at: http://www.jerusalem.se/jerusalem-alb... Artists who have their copyrighted songs registered and monetized via YouTube Content ID receive money anytime anyone listens to their song, no matter who posted it. If you are the artist and have a link for people to purchase your work, want this removed, or want additional albums uploaded, please leave a comment below. 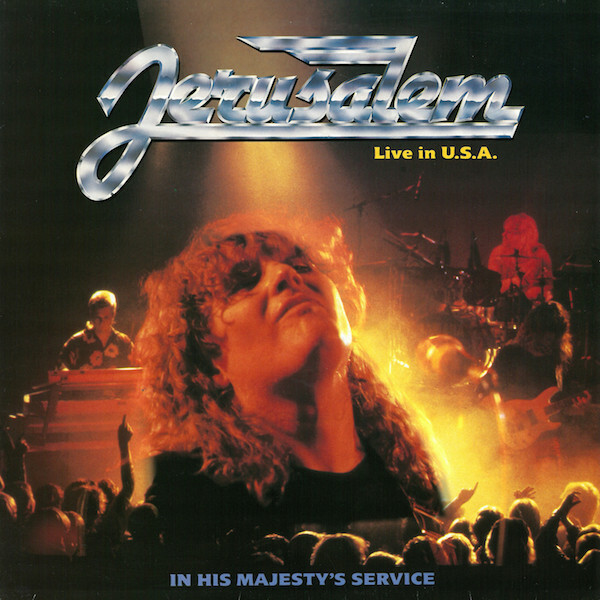 *** artist: Jerusalem album: "In His Majesty's Service" (1985) song list: 1. "In His Majesty's Service" 2. "From the Bottom Of Our Heart" 3. "I'm Waiting For You" 4. "Read Between The Lines" 5. "The Tide" 6. "Ashes In Our Hands" 7. "Can't Stop Us Now" 8. "Time" 9. "Man Of The World" Ulf Christiansson - lead vocals, guitar Peter Carlsohn - bass guitar, backing vocals Dan Tibell - keyboards Michael Ulvsgärd - drums, backing vocals All songs by Ulf Christiansson. NO MATTER WHAT KINDS OF SINS YOU'VE PERPETRATED, EVEN SATAN WORSHIP OR WORSE, LIKE DENYING HIS EXISTENCE: JESUS CHRIST, GOD IN THE FLESH WAS PUNISHED IN (Y)OUR PLACE ON THE CROSS AND HE SHED HIS INNOCENT BLOOD FOR (Y)OUR SINS, BECAUSE HE LOVES US AND BECAUSE HE WANTS TO FORGIVE YOU FOREVER AND MAKE YOU HIS CHILD, BECAUSE HE AND THE FATHER ARE ONE AND HE'S OUR CREATOR WHO WANTS TO SHARE HIS LOVE AND WISDOM AND RICHES WITH HIS BELOVED SAVED CHILDREN, AND HE DOESN'T WANT TO CAST YOU INTO HIS TRASH CAN, THE LAKE OF FIRE, BUT RESTORE YOU AND TURN YOU INTO AN ANGELIC BEING, SO THAT YOU CAN ENJOY HIM AND HIS LOVED ONES AND ALL THE GOOD THINGS HE CREATED, FOREVER. is by something a sinner DOES. They make a person's salvation dependent upon the works of the sinner. But nothing could be further from the truth of God's word. According to the Bible, salvation is by taking what Jesus DID on the cross of Calvary, when he shed his blood to pay for the sins of man. This FINISHED WORK, once and for all, is the only thing that can give man the new birth, forgiveness of sins, and eternal life. unto you, unless ye have believed in vain. what MAN CAN DO FOR GOD! A person is only saved by BELIEVING upon the finished work of Jesus Christ, when he shed his Precious Blood for our sins. This blood atonement was necessary, for without shedding of blood, is no remission (Heb. 9:22). God has always demanded blood for sin. GOSPEL WITHOUT PREACHING THE BLOOD ATONEMENT OF CHRIST AND YOU CANNOT PREACH THE BLOOD ATONEMENT OF CHRIST WITHOUT PREACHING THE GOSPEL!" Jesus Christ's bloody sacrifice on the cross is the only means in which God offers eternal life. Just as we see the blood of Christ in the five wounds He bear on the cross, so we too see the blood of Jesus in the five points of the Gospel. Jesus shed every drop of his precious blood on the cross of Calvary, dying in man's place for man's sins. His blood dropped into the ground. Scarlet and crimson are the color of BLOOD. blood crieth unto me from the ground." Shed blood speaks to God! of sprinkling, that speaketh better things than that of Abel." Christ's blood speaks as well! When Jesus rose again, the Bible tells us Jesus Christ took his blood to heaven, and sprinkled it on the mercy seat there (Heb. 9:12-25), where it's still waiting to wash away the sins of the most vilest sinner! Are you washed in the blood? atonement of their sins. When Jesus died on the cross and the sacrificial Lamb of God, shedding his blood, he fulfilled prophecy written of him all throughout the Old Testament. So there you have it! The BLOOD OF JESUS CHRIST is found all throughout the Gospel. You can't preach the blood, without preaching the Gospel, and you can't preach the Gospel without preaching the Blood. For the Bible clearly teaches salvation is by FAITH, without WORKS (Eph. 2:8,). Faith in what? FAITH IN THE BLOOD OF JESUS CHRIST! just, and the justifier of him which believeth in Jesus. but by the law of faith. Sadly, in our modern age of apostasy, very few who claim to be Christians ever preach the blood of Jesus for salvation. ARE TRUSTING ONLY IN THE SHED BLOOD OF JESUS CHRIST! 37:16 "Man Of The World"
Labels: Gospel of GRACE, Music, Once Saved-Always Saved? If we do not forgive, we are demanding something our offender does not choose to give, even if it is only confession. This “ties” the person to us. If we come from a toxic family situation and have been waiting for something before we can forgive, we need to let go. If we cut loose the ties, we will be free. We will be free in forgiveness.